Two researchers in a boat loaded with thousands of blue mussels, collected from a mussel farm in Lillesand. The boat heads out the Kristiansand fjord, and the researchers deploy the blue mussels in the sea. Why are they doing this? Blue mussel. This shellfish has its home in the intertidal areas in the sea, where it pumps large volumes of sea water over its ciliated gills. 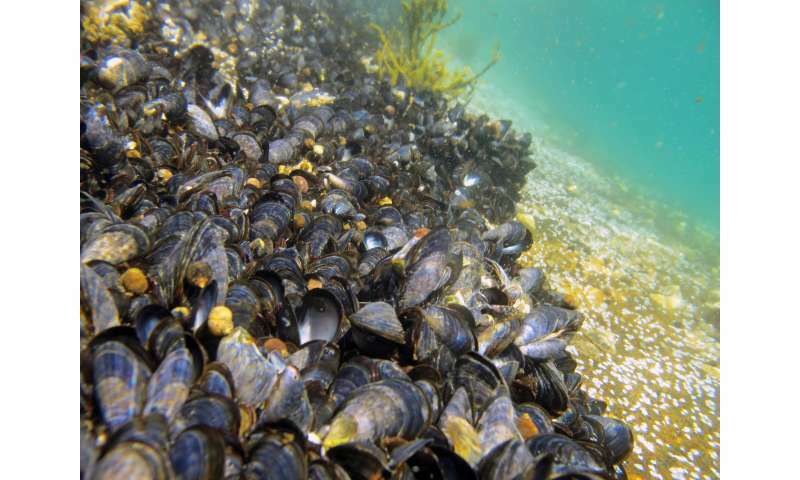 The blue mussel filtrates phytoplankton and pollutants from the water, takes up the plankton as food, and stores the pollutants in its tissues. The filtration and storage of pollutants are so efficient, that blue mussels are used in environmental monitoring; they are like environmental detectives. But, to say something certain about the pollution level in the fjord, a lot of blue mussels is needed; and picking massive amounts in areas where there are only few mussels, or even no mussels at all, is impossible. Now the researchers are experimenting with caged mussels: can newcomer mussels replace native mussels in environmental monitoring? This was what the researchers from the Norwegian Institute for Water Research (NIVA) wanted to find out, as they were driving in the fjord in the boat full of blue mussels. The Kristiansand harbour was perfect for the experiment: Years of metal industry had contaminated the fjord with nickel, copper, and cobalt, in addition to the organic compounds PAH (polycyclic aromatic hydrocarbons), PCB (polychlorinated biphenyls), and HCB (hexachlorobenzene). Two years ago, there were only few naturally occurring blue mussels in the harbour, whilst there were plenty further out in the fjord off Svensholmen. The researchers deployed the two cages in the fjord, one close to the harbour and one by Svensholmen, each containing one thousand clean blue mussels from the mussel farm in Lillesand. "We collected mussels from the cages and from the natural population several times during the following six months," says Merethe Schøyen, the NIVA researcher responsible for the blue mussel experiment. When the test results were ready, there was no doubt the water masses outside Kristiansand were polluted. Six months behind bars had increased the levels of both metals, PAHs, PCBs, and HCBs in the blue mussels. In the cage deployed closest to the harbour, the concentration of nickel had increased up to 35 times compared to the pre-deployed mussels. But increased levels in itself were not what interested the researchers: They wanted to study how the pollutant levels developed over time, and establish how long it took for each pollutant group to reach steady state levels.